Look, I’m not going to sugar coat this. I hated Margot at the Wedding. From the opening, jittery, out-of-focus, poorly lit scenes which scream “I’m an independent movie” to the ending, which is so abrupt the audience is left sitting slack-jawed in their chairs long after the credits have started, this film just does not work. Now, I have nothing against indie films. I don’t mind relationship driven dramas or Nicole Kidman and I think Jennifer Jason Leigh is one of the finest actresses of her generation, but the script for this film gives them nothing to work with. 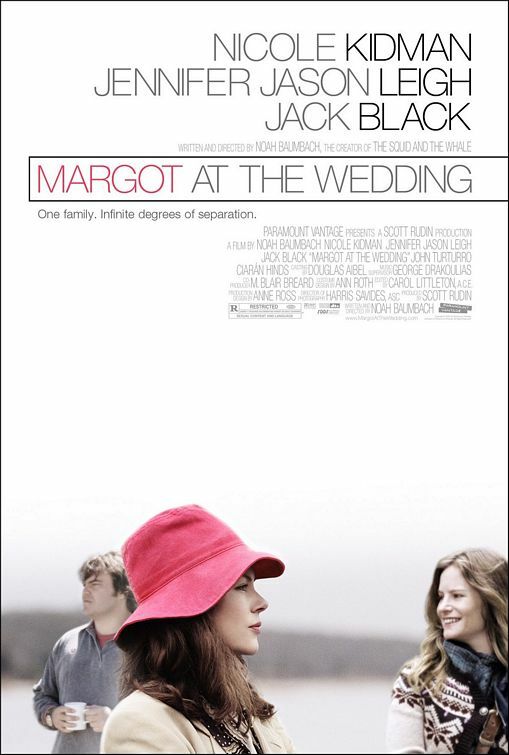 Margot (Kidman), with her son in tow, comes home for the wedding of her estranged sister Pauline (Leigh) to a ne’er-do-well named Malcolm (the horribly miscast Jack Black). All hell breaks loose as the sisters reconnect and there’s your film. Now, if there was something more to it than that, cool. But there’s not. Noah Baumbach, who not only wrote but directed as well, doesn’t give us characters as much as he gives us mouthpieces masquerading as real people. With one exception, none of the characters actually perform an action we hear about, and yet, we are told an awful lot about what kind of people they are. We see none of it. What we do see are characters that use contradictions to simulate depth. Just because someone changes their mind, or goes from loving to angry in a matter of seconds, and with no motivation whatsoever, does not make them real or interesting. And yet, it was hard to look away. Like a train wreck about to happen, we kept waiting for the squeal of brakes and the big collision… but it never came. There was no climax, no rising or falling dramatic action, no resolution and no conclusion. This was like watching someone else’s home movies of all the people they don’t like. In fact, I’m not sure Baumbach even likes his characters. The people with whom he chooses to populate his film with are not only not nice, but they’re not likeable. As a viewer, we are left to watch uncomfortably as they dance around each other, never truly interacting. Baumbach also tries to hard to be quirky. He uses his minor characters (Margot’s son Claude, newcomer Zane Pais, and Pauline’s daughter, Flora Cross) to get out ideas he’s had which didn’t fit anywhere else. Nothing connects here. Not the characters, situations or ideas. And if something was on the way to making some sort of sense, Baumbach as director cuts away from it to save himself the embarrassment of having to actually deal with characters realistically. From a filmmaking standpoint, the camera work is equal to the level the script has set. Cinematographer Harris Savides has a hard time keeping his subjects lit and in focus, which is just distracting, but, when combined with the lack of anything relevant on the screen, it almost seems as if the choice is the correct one for the situation. If there was a reason to see this film, it would be the performances of the two leads. Leigh and Kidman are both top notch and certainly trying very hard to find something redeemable here. On the flip side, Jack Black, who is great as a sidekick, fails miserably here as a romantic lead. He needs a director who will control and use him, and instead he was working with a director who seemed more interested in making sure the quirks were quirky enough to monitor the ridiculous over-acting of Black. During this holiday season, there are far better ways to spend 90 minutes. Root canal comes to mind.